Dream big. Conventional business and life advice. Hardly worth sharing. Would anyone listen if you told them to dream small? But a big dream can become a weight on your progress. It can become stale. Eventually you may look at it and wonder why you every dreamt of it at all. Redream your amazing future often. The dream is not what matters. What matters is the dreaming. Bring your dream up to date. Make it reflect the now. A continuous process of re-dreaming the dream will make it more relevant and more vibrant. It will make it more powerful. 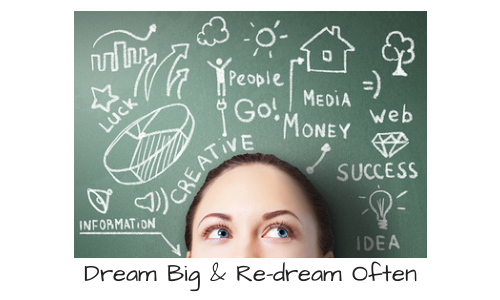 The re-dream will help you find new ways to action and new ways to bring it to lfe. Day-dreaming is a great process to refresh and update dreams. Day-dreaming is when you get to change a dream as it is visualised. If you are collaborating with others it is even more important to re-dream the dream. People change, circumstances change and people change again. Nobody likes delivering someone else’s dream. Dreams are not inherited or imposed. The process of re-dreaming that future together enables everyone to own the dream and stay engaged.